Roberto Mancini, a former Italy player and the current manager of Inter Milan, was born on this day in Iesi in Marche in 1964. Mancini, an elegant and creative forward, was capped 36 times by Italy between 1984 and 1994. After a highly successful playing career, in which he was part of title-winning teams at Sampdoria and Lazio, he enjoyed immediate success as a manager, winning the Coppa Italia in his first season as Fiorentina boss in 2000. He repeated the feat in his second season at his next club, Lazio. Mancini then made his mark emphatically at Internazionale, guiding the Milan club to a club record three consecutive Serie A titles, as well as winning the Coppa Italia and the Supercoppa (a pre-season match between the Serie A champions and the Coppa Italia winners) twice. This made him the club's most successful manager for 30 years. While at Inter, he also set a Serie A record by winning 17 consecutive matches. He was out of football for a year after being dismissed by Inter in 2008, despite his domestic success, having failed to meet expectations in the Champions League, reaching the quarter-finals in his first two seasons but being knocked out in the first round in the next two seasons. He was hired by the wealthy new owners of Manchester City in December 2009 to replace Mark Hughes and again made a quick impact, winning the FA Cup in his first full season in charge, the club's first major trophy for 35 years. The following year, he led City to the Premier League title, making them English champions for the first time since 1968, after a 44-year wait. Success in Europe again eluded him, however, and he was sacked in May 2013, following a shock defeat to Wigan in the FA Cup final. After one season with Galatasaray in Turkey, he took charge at Inter for a second time in November 2014 and his customary winning ways quickly made an impact. 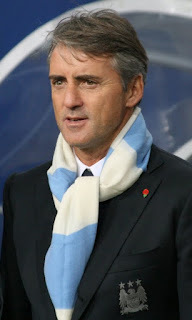 Inter are the current leaders of Serie A.
of Mancini's current club, Internazionale. 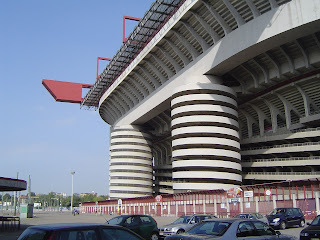 nazionale Milano, often referred to simply as Inter, play their home games at the San Siro stadium in Milan, which they share with their rivals A C Milan. The stadium in Via Piccolomini is a short tram ride out of the centre of Milan. Iesi, the town of Roberto Mancini’s birth, is in the province of Ancona in the Marche region of Italy. Le Marche (the Marches) run along the Adriatic Sea in the central part of the peninsula and are considered a good holiday destination for travellers who like to get off the beaten track in Italy.